Pak PM Nawaz Sharif will now leave for Pakistan on Sunday, Xinhua news agency reported. Islamabad: Pakistan Prime Minister Nawaz Sharif has cut short his London trip over the oil tanker fire incident that killed at least 140 people and injured over 100 others in Punjab province, the Prime Minister's Office said. A statement from the office said Sharif, who was originally scheduled to return home on June 30, will leave for Pakistan on Sunday, Xinhua news agency reported. "Winding up his engagements in London, the PM has decided to immediately return back to country because terror attacks on Friday and oil tanker fire tragedy have grieved the nation immensely," said the statement. Shahbaz Sharif, Punjab Chief Minister, has announced a compensation package of Pakistani Rs (PKR) 2,000,000 ($19,100) for each of the killed and PKR 1,000,000 ($9,550) for the injured. 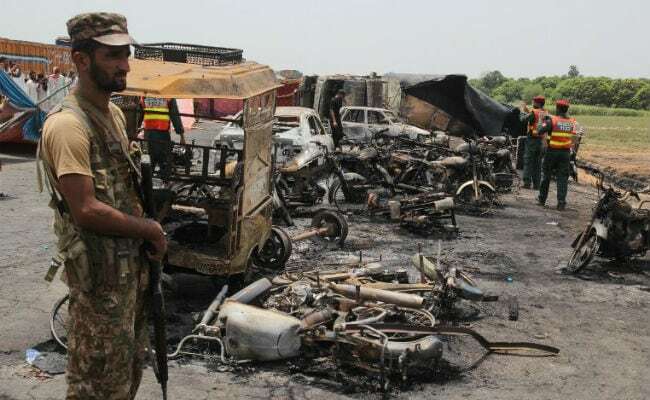 According to police, the tragic incident took place when an oil tanker fully packed with around 50,000 liters of petrol skidded off the road after tire burst on a highway in Ahmad Pur Sharqia, a small town about 400 from Lahore, capital city of Punjab province. The fire broke out after many people from nearby villages came in motorbikes to collect the oil spilled out from the capsized oil tanker. A total of 75 motorbikes and six vehicles including a traffic police vehicle were burnt in the fire, said police. The site was littered with numerous bodies burned beyond recognition, said eyewitnesses. Imran Shah, spokesman of Pakistan Motorway Police, said that initial investigation suggested that the fire broke out after someone on the spot lit a cigarette. However, further probe into the incident is still underway, he said. Four helicopters and a C-130 airplane were used to airlift the critically injured to hospitals in other cities. Rana Saleem, Deputy Commissioner of Bahawalpur, said the toll might further rise as at least two dozen of the injured are in critical condition. Both Pakistani President Mamnoon Hussain and Prime Minister Sharif expressed deep sorrow over the loss of lives in the incident. The Prime Minister also instructed all the concerned authorities to provide the best available medical treatment to the victims.